The organizers of Hong Kong's Umbrella Movement refused to ask for clemency on Wednesday, instead describing their pride in taking their fight for democracy to the streets. In Hong Kong on Wednesday, nine convicts were asked if they wanted to plead for clemency. They refused. The activists had been convicted the day before under colonial-era laws against inciting a public nuisance. 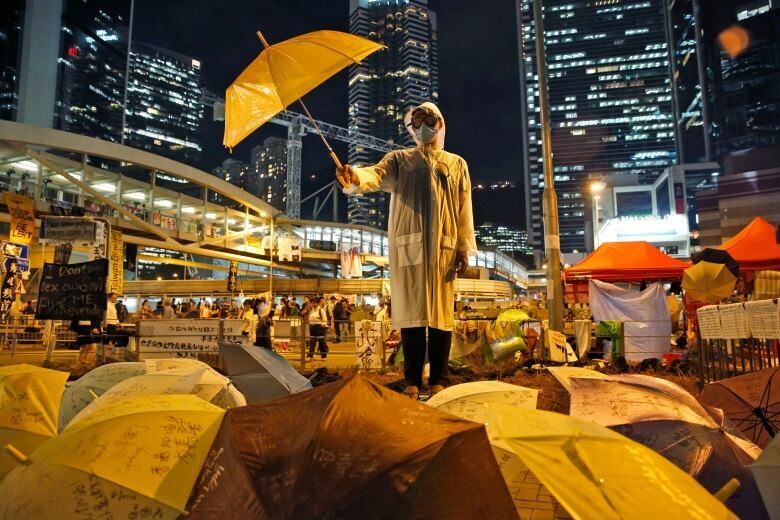 The nuisance in question was the Umbrella Movement — the pro-democracy protests that took in Hong Kong's streets for more than two months in 2014. 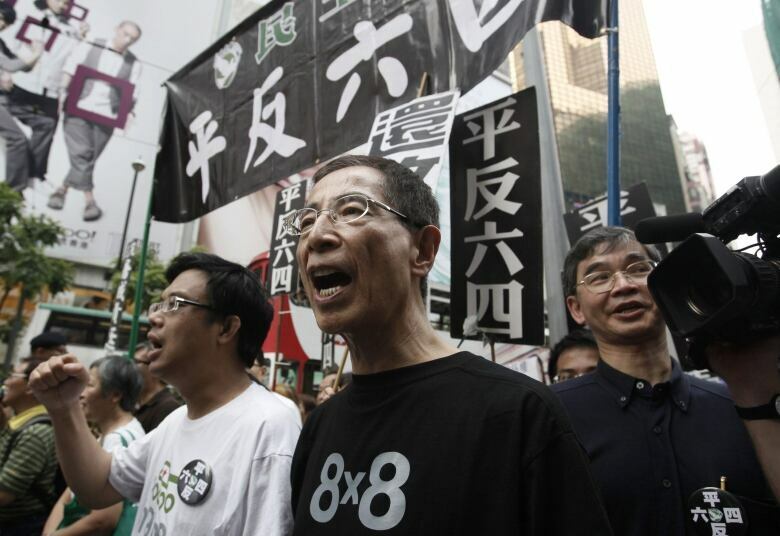 Martin Lee, a barrister and the founder of the pro-democracy Hong Kong Democratic Party, stood alongside the movement's leaders in 2014. He spoke with As it Happens host Carol Off about the convictions. Here is part of their conversation. Why are your friends and fellow activists not asking for clemency? Because they knew they offended the law. And this is what civil disobedience is all about — when you commit a breach of the law, like Gandhi and other people, waiting to be punished. So they are quite ready to go to prison to show that they believe in our cause, and they are prepared to pay the price for it. You'e an opposition leader. You have been part of the protests. What is it like for you to see those people punished, convicted, and not you? I felt pain in my heart, because to see these young people — these particular nine, they are not young — but then there were earlier convictions and sentences imposed on student leaders. They arrested me twice, but they didn't prosecute me. But I suppose once they start to prosecute offences committed by people like me, then there will be many, many more prosecutions. I don't know whether they will stop. They now say that ... this is not the end of it. I'm quite happy to be charged. I feel bad because, well, I don't put so much blame on the judges as the government — because they chose to prosecute under such obscure offences. But are they sending a message? Is this to chill the protests? Oh, yeah, sure — to kill a chicken to warn the monkey, as the Chinese saying goes. And even students within the universities have conducted protests and so on. And some of them were thrown out of university recently. So they're using all sorts of measures to make sure that dissent will not be tolerated in Hong Kong. And all these people, when they organize this Occupy Central movement — later turned into the Umbrella Movement — I think what they are guilty of is ... spreading hope in Hong Kong when people feel so, so much in despair, and a lot of people are thinking of immigration again. They are trying to bring back hope to the people of Hong Kong by giving them democracy, which was already promised. If the government had done its bit, there would have been democracy in Hong Kong 10 years after the handover [of Hong Kong from Britain to mainland China in 1997]. But this is now 22 years after, and still nowhere in sight. In fact, the chief executive [Carrie Lam] recently said again and again that she is not going to pursue it. She's not even going to try. Is the direction for these prosecutions — these convictions — is it coming from Beijing? The government, of course, says it isn't. But these harsh methods [are] clearly now consistent with the policies in China. They believe in the rule by law, and they use the law as weapons against their political enemies. What message would you give to Canadians — to [the] Canadian government — as it pursues trade with China, as it attempts to have have a relationship with China? I'm not against that. 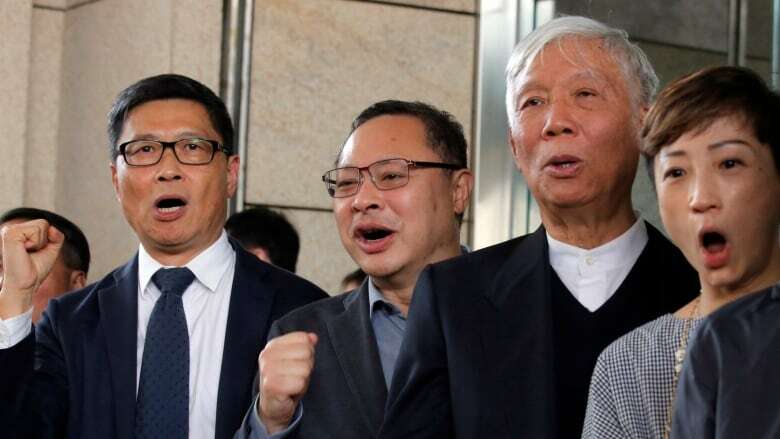 But they have to remember that what is not being done in Hong Kong is in clear breach of [former Chinese leader] Deng Xiaoping's "One Country, Two Systems," which is to give Hong Kong people a high degree of autonomy ... meaning the legislature and judges and all that. In 2014, the Chinese government published a white paper in seven languages claiming to have comprehensive jurisdiction over Hong Kong. The message is when you make a deal with China, how sure are you that it will stick to it? Interview produced by Kevin Robertson. Q&A edited for length and clarity.